Syakar Trading Company Pvt. 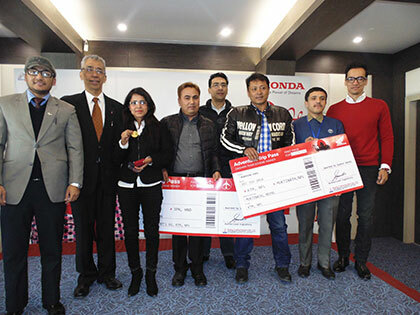 Ltd. (STC), the authorized distributors of Honda for Nepal, handed over prizes to the lucky winners of Dashain & Tihar 2071 Scheme, namely, “WataYojana (HoKhusima Des)” at Jyoti Bhawan. So Scheme started from 23rd of Bhadra, 2071 to 30th of Kartik, 2071. On purchase of Honda Motorcycle, Ms. Ekadevi Mainali with purchase of Honda Dio from Teku Showroom was handed over 10 tola Gold combinedly by Chairman of Jyoti Group, Mr. Padma Jyoti, Chairman of Syakar Trading Co. Pvt. Ltd. Mr. Saurabh Jyoti and Vice-Chairman Mr. Suhrid Jyoti. 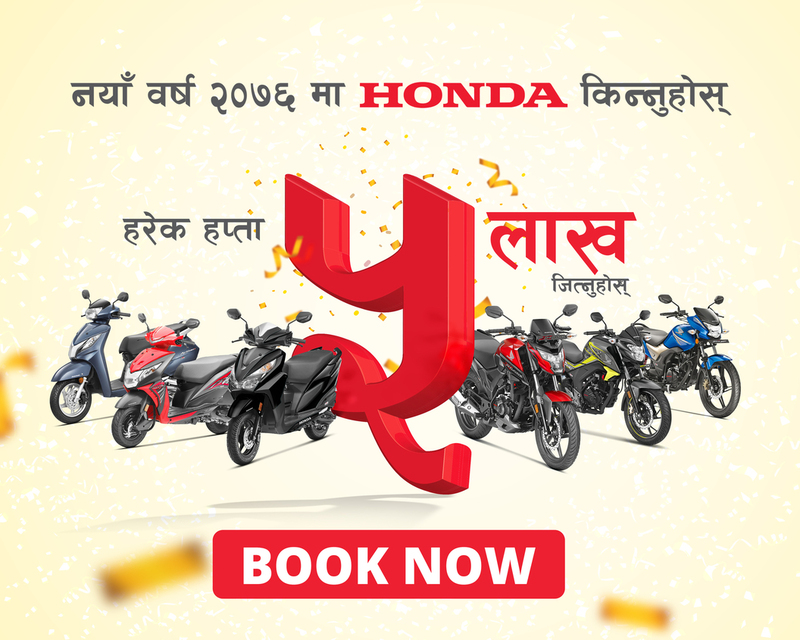 Likewise on purchase of Honda Big Bikes, 5 lucky winners namely Mr. Gyanendra Thapa, Mr. Rabin Karmacharya, Mr. Sushil Kumar Shrestha, Mr. Roshan Kharel and Mr. Nirajan Bikram Karki with purchase of Honda XR 125L from various outlets of Honda were handed over package of trip to Muktinath. And finally on the purchase of Honda Car, Mr. Dirgha Prasad Karmacharya with the purchase of Honda CRV from Thapathali Showroom was handed over a package trip for a couple to Japan.